We have been looking forward to touring Homestead Suites for quite some time, so when we had a chance to meet with manager Kevin Bauldry and owner Paul Woerfel, we jumped on it! Ah yes, Fish Creek, perhaps the most well known Door County destination. It is a town that has it all, shopping, dining and entertainment. We’ve had a lot of fun in Fish Creek over the years and have visited a lot of places there too! Call to make your reservation today and tell them DoorCountyNavigator.com sent you!! Now there are a lot of places to stay in Fish Creek and depending on what you are looking for, you can find plenty of top-notch lodging to suit your needs. There are three things that drew our attention to Homestead Suites. First, it looks first-class. It has an esthetically pleasing curbside appeal. Well-maintained grounds, beautiful flowers and stonework greet you upon arrival. Second, there is a great little café called Julies right next door, check out our review. Finally, it is located right next to the park entrance - Peninsula State Park that is – the largest State Park in Door County. This beautiful park is truly one of Door County’s greatest assets. Hiking, biking, cross country skiing plus much, much more literally right out your door. There are so many things to experience in this park that we’ll talk more about it later. Read on! Homestead Suites offers a variety of floor plans to fit your needs and a very knowledgeable front desk staff. They do an excellent job at helping guests choose the right room. One of the little things we observed while visiting is how the staff at the front desk are truly “ready to please.” During one of our visits that happened to be during “check out” time, Paul, the owner, stepped in to assist his staff. This was impressive because like many of you, we hate standing in line to check out OR check in. Customer satisfaction is very evident with all the smiling faces of the guests as they departed, often giving special thanks to a certain staff member, always calling them by their first name . . . this is always wonderful to observe on our tour! Great job Paul, Kevin and the entire Homestead Suites staff!! We viewed several of the suites during our visit and here is our impression of a couple of them. This suite has a floor plan referred to as the Hickory. It has one bedroom and one bathroom. As you walk in there is a wet bar to the left with lots of counter space and storage in the cabinets below. It has a small fridge, microwave and sink. We would consider this an oversized wet bar, not as big as a full kitchen but completely built in and very nice. To the left, a table and four chairs separate the wet bar and living room. Very roomy and comfortable, the living room has an oversized chair, sleeper sofa, gas fireplace with a TV, built-in overhead and a larger window providing plenty of natural light. To the right of the fireplace is a small dresser, and to the right is a door that leads to a covered patio that has two chairs and a cocktail table. Very nice. The bedroom has plenty of room as well and features a nice king bed with nightstands on either side. Handy reading lamps are secured to the wall allowing for plenty of room for your belongings on the night tables (your favorite book, a glass of water, reading glasses, whatever!). The bathroom can be accessed from the bedroom and from the suite itself. The bathroom has textured wallpaper and a double whirlpool tub surrounded by tile - very warm and inviting. Overall, this is a great suite for a family of four (if you take advantage of the sleeper sofa) or a fantastic room for a mom and dad get-away. This suite features an open concept design. Called the Hawthorne, and according to Kevin, it is one of the most requested room styles that Homestead Suites has to offer. It features a double-sided fireplace that is built in the middle of the room allowing you to walk around either side of it. On one side of the room is a deluxe wet bar, dining area for four, sleeper sofa and chair. The fireplace is in the center of the room and there is a TV to the left. On the other side of the built-in fireplace is the bedroom with a king bed, large wardrobe with built-in drawers, and a handy in-room double whirlpool tub. A very spacious bathroom is right off the bedroom area and has a great glass-door standing shower with dual showerheads. There is also a built-in dresser with a TV to the right of the fireplace. This suite has plenty of room, is very cozy and nicely appointed. We also toured several other rooms with different floor plans and they were all very clean, well kept and decorated nicely. 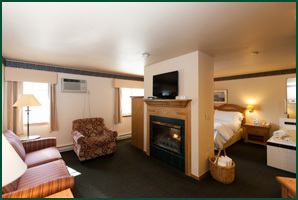 Homestead Suites also offers guest house accommodations with two different floor plans. There is a two level floor plan called The Pine that features an upstairs bedroom with full bathroom, whirlpool tub, TV and queen bed. Downstairs there is a wet bar with sink, microwave and small fridge. The living room has a fireplace, TV and sleeper sofa. The Cedar floor plan is all on one level and includes a king bed, wet bar, whirlpool tub, fireplace, TV and double sleeper sofa. Both guesthouse styles have decks. We did not get a chance to tour these suites so please be sure to call Homestead Suites for complete details if you are interested in these types of accommodations, and certainly visit their website for floor plans and photos. 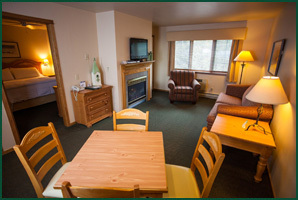 As we mentioned, there are many styles of accommodations at Homestead Suites. The staff is very helpful in making sure customers get what they are looking for. Kevin, the manager, indicated to us that they are very proud of providing clear, honest and straight forward answers to the questions they receive while talking to potential guests. Kevin explained that in many ways they are an information center and that customer satisfaction is their main goal. From our experience, they do a great job at obtaining these goals. Located right off Main Street in Fish Creek, Homestead Suites is just a short walk to all the shops, galleries and restaurants in the village. They are only one block away from the Door County Auditorium, home of the Peninsula Music Festival Summer Symphony Orchestra, and featured home to numerous big name entertainers throughout the year. Enjoy live entertainment at the Bayside Tavern, a local hangout and traveler favorite, or take in a live play at Peninsula Players, the oldest summer theater in the U.S. and just a short drive form your suite. The village itself offers a public swimming beach, marinas and a beautiful harbor providing the stage to view a great sunset. As we mentioned earlier, Homestead Suites is located at the entrance of Peninsula State Park. You can literally walk out your door to the park. Peninsula State Park offers some of the best hiking and biking trails in Door County. There is a complete trail system for everyone to enjoy (you can even preview the trails right on our website under Activities/Biking). The park is open year round for cross country skiing and snowmobiling. You can get a great view of the shoreline from the 75 ft observation tower (which we recently climbed) or explore the Eagle Lighthouse. Like the theatre? American Folklore theatre is located inside the park and is a definite “must do” if your visiting Door County. There are even daily activities for the kids! There is a great place to rent bikes conveniently located across the street called Nor-Dor Sport & Cyclery or if you have your own, Homestead Suites offers free bike storage. These are just a few of the activities you can partake in, for complete park sight seeing activities feel free to ask the front desk staff at Homestead Suites or call the park at 920 868 3258. When you’re not taking in the village or experiencing the park activities, you can enjoy the first class amenities Homestead Suites has to offer. You can choose either indoor or outdoor pool facilities. The indoor pool room has a vaulted ceiling, banks of windows at each end providing lots of sunlight, glass doors that lead to a stone patio for sun bathing, a nice “spade shaped” hot tub and a rinsing shower. The floor is completely tiled and there is a waterfall that goes into the pool and the hot tub. A 12-person sauna and a game room off the pool area complete this facility. The outdoor pool is equally impressive. It is completely fenced in providing lots of privacy. There is also an outdoor whirlpool that is open year round--cool! Again, nicely landscaped grounds and plenty of lounge chairs, tables (some with umbrellas) add a nice touch. Other amenities you would expect at a top-notch resort of this kind include a library room with a television that overlooks the indoor pool. A great place to sit and relax or catch up on some reading. There is also a great conference room that is perfect to hang out and play games or enjoy a cup of coffee. There are tables and chairs for sitting and a couch and two chairs situated in front of a fireplace and TV. The conference room is located in the West wing of the resort and is where you can enjoy a great continental breakfast, or there is also a continental breakfast served in the lounge area right off the main lobby. You can expect all the standard items in the morning including coffee, juice, milk, cereal, muffins and the like. There’s plenty served and plenty of room at the tables to enjoy it too! All in all, we feel Homestead Suites offers first class accommodations that you would expect from a resort of its type. Our experience with the staff was spectacular, and the entire facility is very will maintained and inviting. Of course, the location is absolutely fantastic. The prices are reasonable for all you get; remember to check with the staff for off season specials and specific room rates. No matter what time of year, if you’re traveling to Door County, check in to Homestead Suites in Fish Creek. Give them a call TOLL FREE at 1 800 686 6621 and visit the Homestead Suites website for plenty of photos, room layouts and more! And they are open in winter too! And please tell them that DoorCountyNavigator.com sent you to The Homestead - that helps keep this site alive & well for you! Thanks!